I’ve been growing kale for several years. This vegetable is really easy to grow, the bugs seem to ignore it and the harvest is usually quite abundant. We do two different types. These shots were taken in our plot late July. The usual kind you see in the grocery store is the curly leaf kale. The other type we grow is the red winter or Russian kale, which has large flat leaves with jagged edges. It grows a lot larger than the curly leaf type, up to 3 feet high. We don’t do anything particularly exotic to grow the kale. We use an organic fertilizer, we mulch with horse manure and whatever else the town provides at the organic gardens and we water several times a week. Occasionally I see small white flying insects on the leaves but they don’t seem to be injuring the plants in any way. I was them off with the hose. Kale or borecole (Brassica oleracea Acephala Group) is a vegetable with green or purple leaves, in which the central leaves do not form a head. It is considered[by whom?] to be closer to wild cabbage than most domesticated forms of vegetables. The species Brassica oleracea contains a wide variety of vegetables, including broccoli, cauliflower, collard greens, and brussels sprouts. The cultivar group Acephala also includes spring greens and collard greens, which are extremely similar genetically. 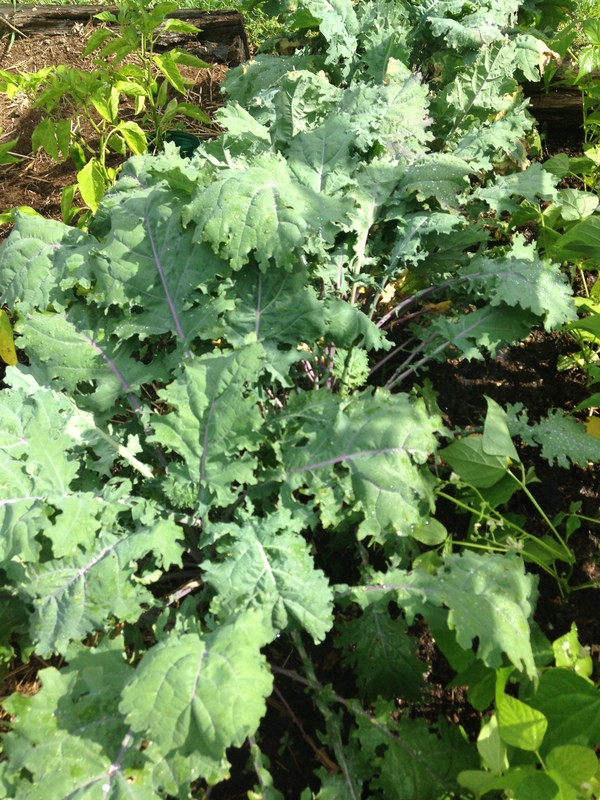 We plant the seeds early in the spring as the KALE likes the cool weather. We’ve used seeds from several sources including Burpee.com, Home Depot and the local hardware store. We sow directly in the ground. There’s no need to start them indoors. It takes a few weeks for the plants to get rolling but once the leaves appear they grow with a regularity that we can never keep up with. We cut the leaves from the bottom of the plants which allows the top leaves more room to grow and reach the sun. We add the kale to asian inspired stir frys, stews, soups and as a side dish with a simple garlic and oil recipe. We freeze quite a bit of the leaves and we have it all winter. WIKIPEDIA describes these culinary uses for KALE. 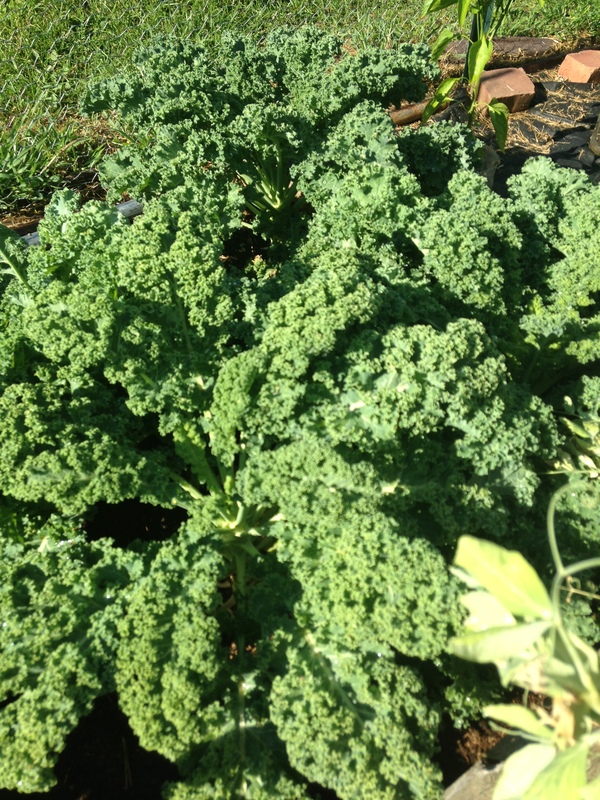 Kale freezes well and tastes sweeter and more flavourful after being exposed to a frost. Tender kale greens can provide an intense addition to salads, particularly when combined with other such strongly flavoured ingredients as dry-roasted peanuts, soy sauce-roasted almonds, red capsicum flakes, or a sesame-based dressing. When combined with oils or lemon juice, kale’s flavor is noticeably reduced. When baked or dehydrated, kale takes on a consistency similar to that of a potato chip. Curly kale varieties are usually preferred for chips. The chips can be seasoned with salt or other spices. I paint kale with canola oil, onion powder, garlic powder, spicy hot sauces, soy sauce and nutrtional yeast, and then bake for a couple of hours at 200-250 degrees to make tasty kale chips. In addition we always add fresh kale leaves to our smoothies. The World’s Healthiest Foods web site (whfoods.com) talks about the great health benefits of eating Kale. Give a kale a try. It’s tastes good…and it’s good for you! This entry was posted in Gardening, Growing Vegetables, Health, Uncategorized and tagged Brassica, Brassica oleracea, Collard greens, Health, Kale, Leaf vegetable, United States, World. Bookmark the permalink.